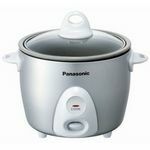 I like the Panasonic 3 Cup Automatic Rice Cooker for when it is just for two people. It makes just the right amount of rice and you know it will not get wasted or go bad. The rice is done in little time and is fresh and fluffy and very simple to prepare. I have had better results making rice in the rice maker than in the pot. So I use mine often. If you want to keep it warm for a little while there is that option as well. It is super simple to prepare and great for beginners cooks or if you just want to whip up a fast rice recipe. It is really good when you add a little flavor, or veggies and sauces as well. Performance I have had great results and my rice cooker has lasted a long time. Ease of Cleaning Super simple to clean, you just pop out the tub part and you are set to wash. Ease of Use Easy as pie, a kid could do it. Durability Mine has lasted a long time, more than a few years. Design The design is simple and practical and all you need to have a nice rice prepared quickly. I've owned the Panasonic Automatic Rice Cooker for four years now and it's a nifty little compact basic rice cooker that has done an excellent job of cooking perfect rice for my home for years. I've only made white rice in my Panasonic Rice Cooker as that is the only type of rice I essentially want with meals for dinner time. I've always been a fan for Panasonic as they have always made products that last for years and my rice cooker is still going strong even though the one before it only lasted for over a year. The only cons I have found with my use of the Panasonic Rice Cooker was that something during the cooking the water I poured in there would foam up and sputter out from the edges but this was easily remedied by me just putting in less water than the recommended amount that is stated on the manual. The last con is that the non-stick coating is starting to show its age and I can't really remedy this other than buying a new rice cooker. So other than the non-stick coating peeling away it's a great basic cooker for families or cooking for just one person. Highly recommend buying this rice cooker for basic home cooks and large families will not disappoint you. This little rice cooker has been cooking up rice for our family for many years! It can do a small amount or a large amount of rice up to about 3 cups of dry rice. I would not use it for that much though, since the cavity is really not big enough to hold that much and cook evenly. I usually make between 1 - 2 cups of dry rice and use twice the water when I make rice. It always comes out nicely done and clean up is pretty easy. I do have some comments with regard to the lid. The lid is glass and sits on the rim rather loosely. I'm sure that's important to give the cooker some room for the steam to escape. The only problem is that the steam/water does tend to spew out at the time when the cooker is brewing the highest. This makes a bit of a mess on the countertop and sometimes on my cabinets and splashboard. Since this little machine is in all other respects, simple, easy to use and cooks the rice very well, I can easily live with the cleanup it causes. 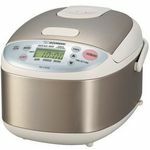 I am happy with this rice cooker and would recommend it for anyone needing a very basic appliance. We cook a lot of Asian dishes in our house, so my husband thought the Panasonic 3-cup Automatic rice Cooker would make a great little addition to our kitchen appliance collection. I was skeptical at first. I always made rice the regular way and didn't see much of a use for this unit. Boy, was I wrong! It is very sturdy. It makes enough rice for the two of us. It is simple to use.You can set it and forget it., because it will shut-off on its own! we use it quite often and it has never burned any rice. I have never had any under cooked rice.Rice comes out properly cooked and all you have to do is fluff it with a fork and it's ready to serve! The price is more than reasonable for this handy product. It's available at a variety of stores.I would recommend it for a single person or a 2 person household. I recently purchased another one for my sister in-law's birthday. I do not see any downsides of buying this rice cooker. Performance Cooks rice thoroughly ! Ease of Cleaning Cleans up fast and easily! Ease of Use It is very simple to use. Durability It is quite durable. Design Nice, simple design. It's a small appliance but very useful to bring with you when on vacation. Our family loves to eat rice so we bring this with us everywhere, including to Vegas, camping, and other family vacations. We use it to cook both rice and instant noodles as well! Performance It only cooks up to 3 cups, but it does its job. Doesn't have any extra features like the bigger rice cookers, but you don't need that if you just want to simply cook some rice. Ease of Cleaning It's so small that it makes it very easy to clean. Nothing special or complicated about it and you don't have to read any instructions to know how to clean it. Ease of Use It's small, compact, and portable which makes it easy to use. There are no special features or buttons you need to learn how to use. Just plug it on, and turn it on. Durability I've had it for 1 year now and don't have any problems with it so far, and I use it quite a bit too. I bring it with us on almost every family trip. Design The design is simple and compact. I just wish they could come out with one that uses batteries instead of a plug so that you have even more options to use it in places without plugs! Boy, is this little appliance efficient! 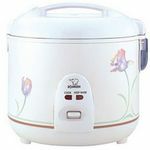 I grew up only cooking rice in traditional multipurpose steamers. That was the only way I knew how to make rice. My husband had this little Panasonic rice cooker, so when we moved in together I saw this little machine at work. It makes just as good of rice as my traditional steamer does, but in about half the time. I'm still shocked to see just how fast this rice cooker cooks rice! If we are in a hurry (as we usually are) we will use this rice cooker to make the rice - by the time we've heated up our dishes to go with the rice, it's just about done cooking. It's amazing! Who knew something so economical could be so great?\ It's a little small so you won't be able to cook enough rice for more than 3 or 4 people (depending on how much rice each person eats), but that's more than enough for most average families. 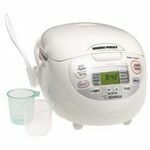 The Panasonic SRG06FG 3 cup Automatic Rice Cooker is simple and easy to use. This rice cooker is good for a household of one or two people. It makes the right portion amount for one or two people and usually there is enough for left overs. I also like it because it can cook brown rice. Just follow the directions. There is only one button on it--like I said, easy to use. This also means that there is less to break. A friend has a fancier one with a digital display and the display often goes in an out. But it is still a smart rice cooker-- it will even turn itself off after a period so you do not burn your house down. The only bad thing is that the bowl sticks to the rice sometimes or that the bottom layer of rice will burn slightly (just a tan color, not black). Put in the rice/water, come back when dinner's done cooking! When my husband first said he wanted a rice cooker I thought he was nuts- why pay for an appliance like that when we're on a budget? But seeing as his birthday was coming up, I bought this little Panasonic SRG06FG 3 Cup Automatic Rice Cooker for him... and am I glad I did! I think I use it more than him now! 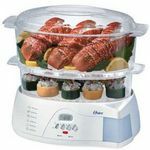 The beaty of this is it's time saving ability- you throw in the right amount of rice and water, turn it on, and don't worry about it again until it's time to eat! It cooks the rice to absolute perfection, every time, and then keeps it warm for hours until you're ready to eat it. It comes with easy to follow, clear instructions and works with the flip of a switch on the front. Cleanup is so quick and easy it spoils you- just take out the top bowl and wash off the non-stick surface. Even rice that's been forgotten long enough to stick or burn (which takes a LONG time!!) comes off quickly and easily. This is worth every penny you spend! This Rice cooker is the perfect size for my little family, and that is important to me considering I dont have much kitchen storage space. It doesnt get very hot on the outside, and it doesnt make a mess on my counter with water spilling (boiling) out. It is so simple to use, my son now says cooking rice is easy peesy. Just add the water and rice and turn it on. The rice comes out great, with other rice cookers Ive owned before there would always be some water left over. Not with this baby. I also dont just use it for cooking Rice, it works wonderfully at steaming vegetables as well, and they come out so tasty. A friend of mine makes oatmeal in hers! It is easy to clean. While there is no need for a Rice Cooker as it can be made in a pot on the stove, but then it wouldnt be so easy and pratically effortless.